Item245 - Levels taken in Perth by James Cowle (Lincolm, Stirling & Palmerston Streets) [Tally No. 005355]. Item246 - Levels taken in Perth by James Cowle (Brisbane, Beaufort, Roe & Palmerston Streets) [Tally No. 005356]. Item247 - Level in Perth by A.C. Gregory (Lake Irwin, Lake Kingsford, Wellington, Mackie, Moore, Short & Mangles Streets, Claisebrook) [Tally No. 005357]. Item248 - Proposed Railway from York to Albany (Levels) by John Forrest (York, Beverley, Brookton, Hotham River Valley, Chugamooning, Dodds etc.) [Tally No. 005358]. Item249 - Proposed breakwater at Gage Roads Fremantle [Tally No. 005359]. Item250 - Serpentine River and adjacent country by Tho. Watson (property of Thomas Peel) [Tally No. 005036]. 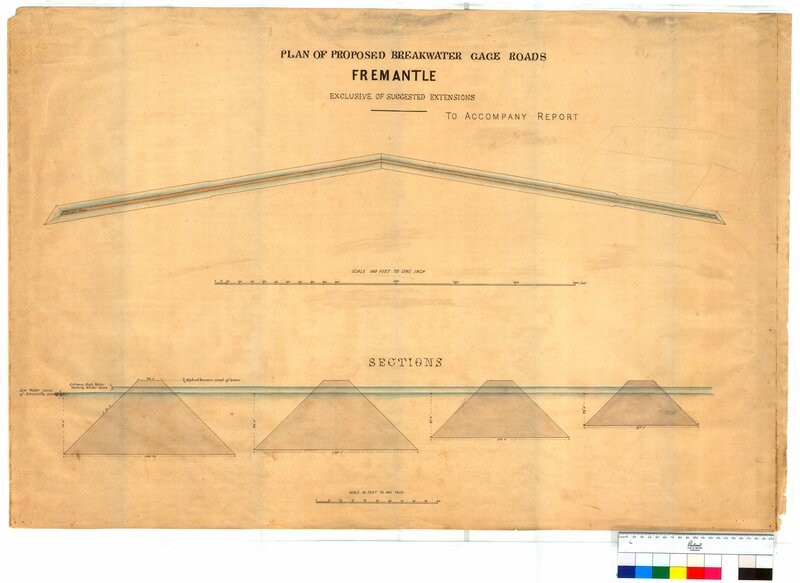 Item251 - Road from the Dandalup Bridge to Fremantle, Sheet 1. From 3 mile peg to 18 mile peg by T. Watson [Tally No. 005037]. Item252 - Road from the Dandalup Bridge to Fremantle, Sheet 2. From 19 mile peg to 31 mile peg by T. Watson [Tally No. 005038]. Item253 - Road from the Dandalup Bridge to Fremantle, Sheet 3. From 32 mile peg to Fremantle by T. Watson [Tally No. 005039]. Item 249 - Proposed breakwater at Gage Roads Fremantle [Tally No. 005359]. Proposed breakwater at Gage Roads Fremantle [Tally No. 005359]. Confirm Item Request: Proposed breakwater at Gage Roads Fremantle [Tally No. 005359].